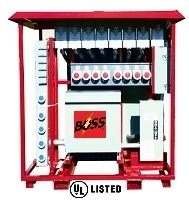 PORTABLE SQUARE D PANELS EYE-LINE products are the most popular circuit breaker panel boards used for high voltage switchgear products. Boss assembles Square D Brand I-line products in a variety of product presentations. Clients have the choice to request the number of breakers and amp/poles needed per breaker for their specific product requirements. I-line systems are available from 200amp to 1200amp panel boards. These panels will be mounted in Nema 4 enclosures to allow for the installation of pin/sleeve receptacles to be placed down each side of enclosure. 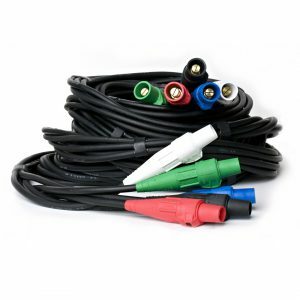 Line power is feed to panel board through cam-locs or direct hardwire entry from bottom of enclosure. Panels can be installed on roll around protective cages, skid bases or with conductive caster wheels. 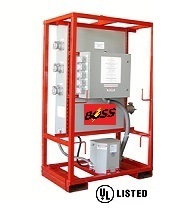 Bossltg is a UL1640 Certified job-site electrical power distribution assembler. After assembly of I-line product each product goes through a number of performance tests. After tests all outside components are labelled and a product name plate is installed per UL Standard requirement. 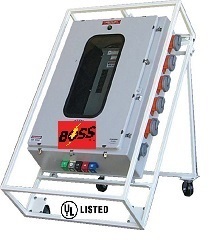 Bossltg then assigns a UL1640 Certification Serial Number that will stay with specific product throughout products life. 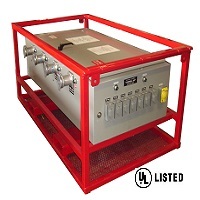 This UL serial number is registered with Underwriter’s Lab for OHSA to track. UL1640 Certification is required on all Federal Construction Projects.